Delta Auto is a nationwide car dealership and Finland's largest Kia dealer, representing the Mitsubishi, Mazda and Opel brands. They are also one of the largest sellers of used cars in the country. 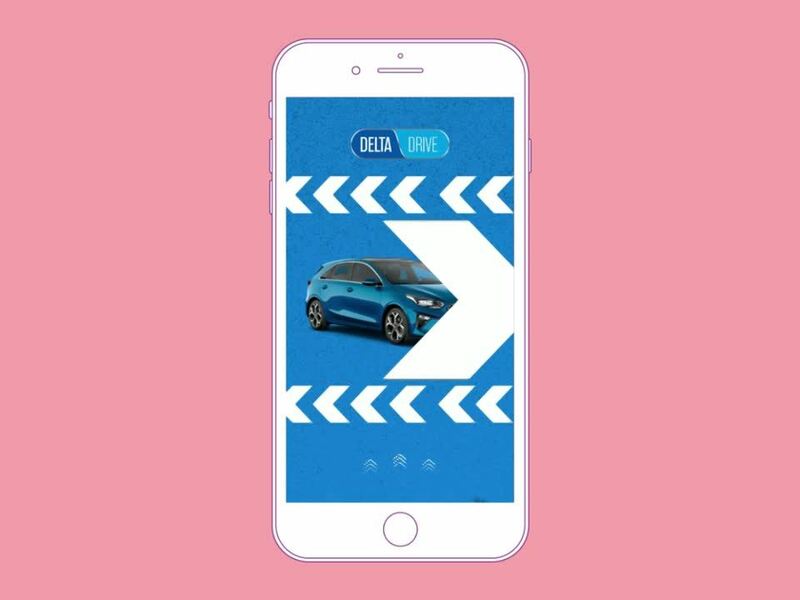 With a vast and ever changing catalogue of vehicles, Delta needed to find a way to scale their offering on used vehicles, with on-brand creatives to convert customers who had already browsed the car selection. Delta wanted to drive prospective customers to their financing calculator where they could get a quote on their desired car and financing options. The aim was to sell their used cars as quickly and as cost-efficiently as possible. 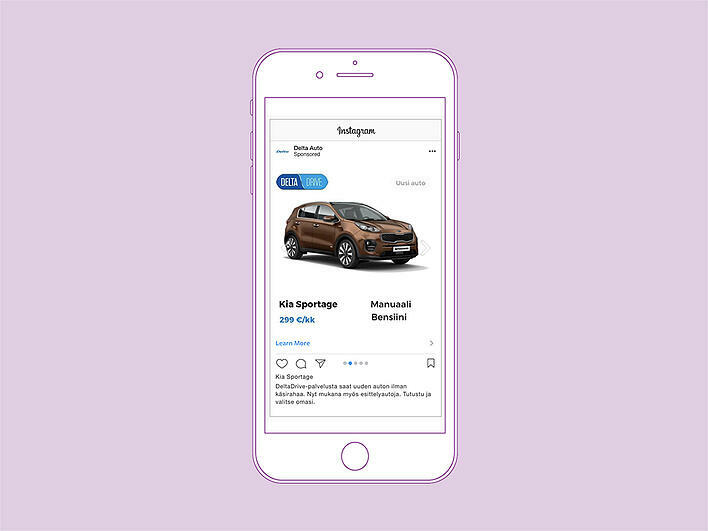 Smartly.io partnered with Delta’s media agency Toinen PHD, using dynamic retargeting to reach the audience that had already browsed the cars on their website. To ensure there wasn’t any compromise in branding while scaling up the advertising, Toinen PHD adopted Smartly.io’s Dynamic Image templates in their creative production. By using these templates, the agency featured the right cars in the creative and also customized the brand font, color and additional information in the ads to deliver personalized ads based on customer’s search and purchase intent. 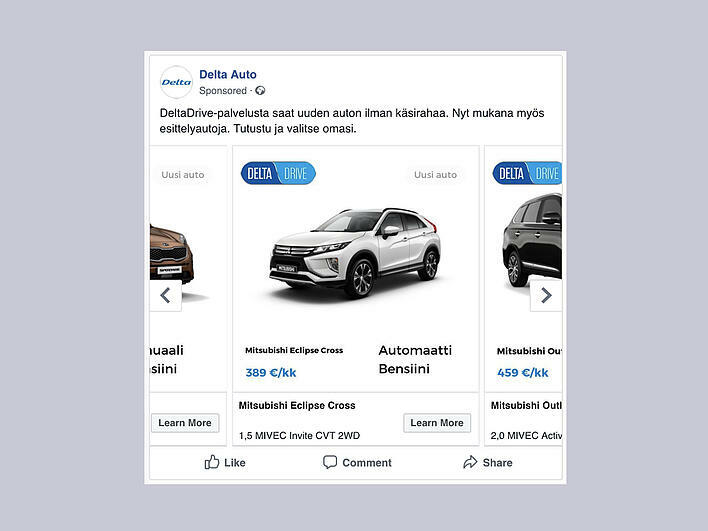 Combining Facebook’s powerful retargeting methods and Smartly.io’s scalable creative solutions, Delta and Toinen PHD saved approximately 100 hours in creative production and served ads that were both on-brand and effective. Smartly.io’s templates enables us to produce ads that are brand friendly and drive better results. In addition to this, using templates has made us agile and we can do changes quickly when needed.